If you are looking for a night time activity, Samurai Museum is the place to be.You can enjoy Samurai Live Music Show every weekend at 8:00 pm. We show you the duet of SHAKUHACHI(bamboo flute) and KOTO(Japanese harp) played by our finest Japanese musicians. It is cozy and casual atmosphere where you can just relax and enjoy listening to the beautiful sounds of Japanese musical instruments. What is more? Our live music show is quite fun and interactive. You can get a chance to play the musical instruments with the instruction from the professional musicians. 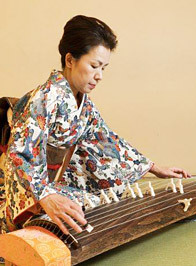 We play both traditional Japanese music and western pop music. And we also explain about the musical instruments and each music with an English speaking translator. If you like to entertain yourself musically, we are sure you will have quite fun experience by joining this special event. There are only limited seats available for each show so please book tickets to get good seats! *Please note that Samurai Museum closes at 20:00(the last entrance is 19:30) on Friday, Saturday and Sunday due this event. During Mon-Thu, we open as usual (from 10:30 to 21:00 *the last entrance is 20:30). We are sorry for the inconvenience this might case. The professional musician who plays traditional Japanese bamboo flute called Shakuhachi. (尺八）The melody he creates is dynamic yet relaxing to listen to. 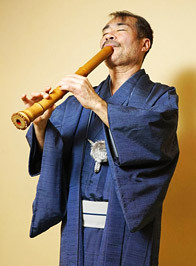 He has been playing this musical instrument for more than 40 years and teaching young shakuhachi players. He has been in a lot of media outlets to spread traditional Japanese culture to the world. Being fond of western pop music, Grand master Ishikura has been releasing his covers of Queen,Ariana Grande,Taylor Swift and etc… on his Youtube Channel. 1964: Born on October 14th , when the first Tokyo Olympics were taking place. he played “Shake it off” in front of her. He got introduced by Taylor Swift’s instagram.